Robert David Ross, Master Sergeant, born Jan. 9, 1917, Fulton County, AR. 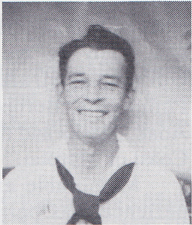 After some college he joined the USN July 12, 1938. Basic training was at San Diego. Served in West Virginia, Dewey, Maury Amphibious Base and Pearl Harbor. Memorable experiences was abandoning West Virginia on Dec. 7, 1941 and Coral Sea and Midway engagements. He was discharged Oct. 10, 1945 as CY and retired July 31, 1962, as MSgt, USAF. He received the Presidential Unit Citation and all the usual medals for serving in the Pacific. Married Clara (Fuge) and they have two daughters, Nancy and Linda and three grandchildren: Nathan, Sean and Bradley Miller. Retired after 20 years clerical work with Bureau of Prisons. Hobby is golfing.